The mother of this baby was diabetic but the obstetric history was unremarkable. The baby was delivered by caesarean at 35 weeks. The birth weight was 1080g. The child's ears were large and simple and abnormally rotated. There was hypotelorism (eye orbits close together), a flattened facial profile and nasal bridge. The nasal septum was incomplete anteriorly, but there was no cleft lip or palate. 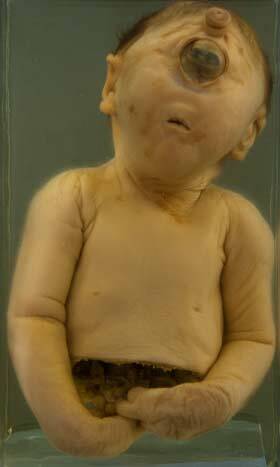 Based on the dysmorphic face and skull, a clinical diagnosis of holoprosencephaly was made. Other non-cranial anomalies were noted but a recognised syndrome could not be identified. The baby died after 2 days. 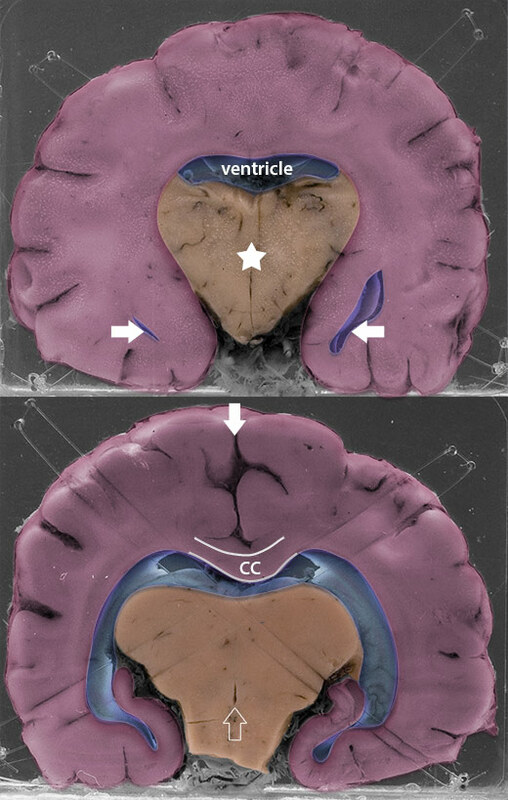 This coronal slice of the brain shows the features of a semilobar holoprosencephaly: Viewed from the anterior, the cortex and underlying white matter form a continuous horseshoe or holosphere, ie. without the normal two hemispheres with dividing fissure. There is a small continuous ventricle with the inferior horns of the ventricle just apparent in this view (arrows). The central mass (asterisk) represents the fused basal ganglia, without the normal intervening third ventricle. The reverse of the specimen shows separation of the holosphere into two hemispheres by a central fissure (solid arrow). Here we see the beginning of a corpus callosum (CC). The ventricular cavity is still single and not divided by the normal midline structures of the septum pellucidum and fornices. The midline thalamic mass is now continuous with the brainstem, and the 4th ventricle is seen as a narrow slit (open arrow). This brain was from a stillborn baby. 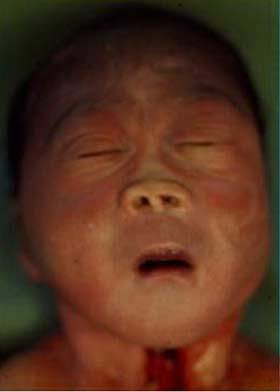 He had features of trisomy 13 (Patau's syndrome). The brain is small, with a single lobe which is a helmet-like fold of white matter. A slight degree of cleavage is seen inferiorly on the anterior surface. Posteriorly, the single ventricle cavity was roofed by transparent meninges and contained about 100ml of cerebrospinal fluid. In the floor of the cavity the fused midbrain is seen. No olfactory bulbs or optic nerves were identified in the brain of this child and the pituitary fossa was hypoplastic. The 3rd and 4th cranial nerves could not be identified but the 5th and subsequent nerves were normal, as was the hindbrain. There is no data recorded for this premature infant (below). The head and torso have been preserved. The most striking feature is the cyclopean eye; there appear to be two corneas and irises fused into one eye, with four lids in a rhomboid around it. A proboscis situated above the eye represents the nose. The mouth is very small and so is the chin / lower jaw (micrognathia). This is the most severe end of the spectrum of facial abnormalities and would be correlated with the most complete form of holoprosencephaly, such as CASE 2. Holoprosencephaly is a spectrum of malformations that occur when there is defective midline patterning during forebrain development i.e. there is failure to cleave (divide) into two separate hemispheres. Incomplete cleavage is called lobar or semilobar holoprosencephaly, depending on the extent. If there is no cleavage at all the condition is called alobar holoprosencephaly. There are associated facial anomalies reflecting the concomitant failure of eye, nose and mouth formation. (The olfactory bulb and and optic nerves are often hypoplastic or absent.) The severity of the facial anomalies tends to correlate with the severity of the cerebral lesion, "The face predicts the brain". Most children with the more severe forms of holoprosencephaly die in the first year of life. Surviving children with the lesser forms of holoprosencephaly have developmental delay and ultimately a degree of mental retardation dependent on the severity of the brain lesion. Seizures are common and there may be pituitary dysfunction such as poor temperature control. The aetiology of holoprosencepahly is heterogenous. Up to 50% of babies with holoprosencephaly are found to have a chromosomal abnormality of which the commonest is trisomy 13. Maternal diabetes is an important non-genetic cause of holoprosencephaly; the risk of an affected infant is 20x higher than in the general population. Single gene mutations have also been shown to cause a proportion of cases of holoprosencephaly, and this is likely where the condition is familial. Genetic counselling is essential for parents of a child with holoprosencephaly and chromosomal and genetic studies are indicated as part of the work-up to determine the recurrence risk. High resolution ultrasound or preferably foetal MRI in subsequent pregnancies may detect brain or facial abnormalities by the mid-trimester, allowing for the option of termination. For a surviving affected child there is no treatment for the brain malformation and management is symptomatic.